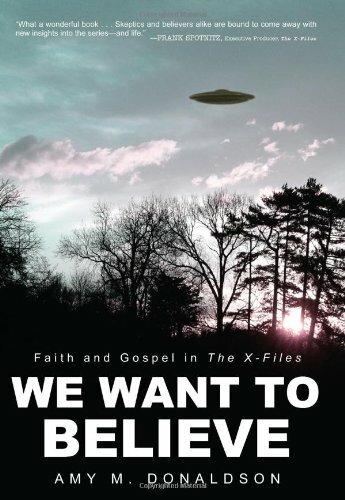 We Want to Believe: Faith and Gospel in the X-Files by Amy M. Donaldson. ISBN: 9781606083611. Although not the primary focus of Donaldson's book, her mention of the lack of religion in science fiction surprised me and sparked more thought than the rest of her book. Part of that is probably my general lack of interest in Christianity and a casual enjoyment of X-Files, but as a lifelong science fiction fan and spiritual person, I was surprised that I did not really notice that religion was missing from most sci-fi. There are of course a few exceptions, Mary Doria Russell's The Sparrow immediately came to mind, as did The Parable of the Sower, and Tankborn if only because I read it recently. All three of these works (interestingly all written by women) use religion in very different ways. All three mention Earth: Parable is set there and stays there, The Sparrow begins on Earth and ends there with portions of the narrative occurring on an alien planet, and Tankborn is set entirely on an alien planet, although the population originated on Earth. All three were used effectively as part of the narrative and in the first two were even the primary focus of the book. So why do/have so many science fiction authors seemingly ignored or at least glossed over religion? Perhaps its basis in science has something to do with this. Those who feel enlightened by science and rational thought sometimes feel that religion has no place in an equally enlightened future/higher society. While I might be inclined to agree with that as far as government mandates are concerned, I do believe that religion has its place in society and will continue to be a useful tool, even for those of us who do have a conscience based on our own experiences and beliefs, rather than allowing a more authoritarian dictation of conscience. For instance, a society based on rational thought and science may not prevent the wholesale murder of groups of people. Science and rational thought might lead to the conclusion that if a population is sick and dying, it would be best for the rest of the community to quarantine that population until a cure or vaccine could be provided. While this seems like a reasonable thing to do, it is also in some ways a heartless thing to do. In this way religion ought to guide our rationality to a more compassionate behavior. Rather than allowing those beings to suffer alone, those inclined to care for the sick and the dying (the doctors, nurses, and other caregivers) will attempt to provide the best comfort they can, even at the risk of becoming sick themselves. Would a future without religion really be so appealing to us? As we have all suffered our own personal anguish, would we relish a world where rationally it would be wise to separate ourselves from the pain of others rather than attempting to provide relief? Granted, there may be those whose conscience and rationality lead them to provide this charity anyway, and there are certainly people who claim to be Christians who ignore or reject that particular teaching of Christ (in behavior if not in word). Yet I would rather see religion remain in place to offer that guidance than see a world barren of any source of hope, faith, charity, forgiveness, and many of the other themes touched on in Donaldson's work. It definitely makes The X-Files a braver show than I first realized it to be, and I hope to see more science fiction writers (whether of books or visual media) take it upon themselves to create more stories that include religion, positive and negative, in their works. LibsNote: Copy received as gift. An interesting point. It feels a lot like religion is either ignored in modern creations or implicated as a detrimental, restrictive force. The orders and convents that were largely portrayed as taking care of orphans and the sick now seem to be implicated in cruel, intolerant or horrifying acts more often. It's likely due to the pendulum swinging toward more liberal and tangible ways of thought (combined with vocal religious groups pandering to closed and extreme ways of thought), but as you point out, when disasters happen or people are in need, there are often religious groups there as a silent, compassionate force. It would almost seem like a shoe-in for certain sci-fi universes. Good observations, but I wonder why so many people feel that liberalism and religion don't go together. Granted, I am not sure the authoritarian version of Christianity is good for the nation overall, but first and foremost religion is suppose to _encourage_ reflection and introspection about the state of the soul and the human condition. Those are very much values espoused by the people who founded the United States of America, and others interested in seeing liberty flourish.